Very rarely would our fridge be found without carrots. It's one of those things that I do not hesitate picking up at the grocery even when I'm not sure how much of it we have left because I know it's going to get used up pretty quickly anyway. We use them in salads, meat sauce, sautéed vegetables, stir-fries, soups, stock, and baby food. It is rich in vitamin A, K and C, and a good source of potassium and fiber. Its sweet, earthy flavor is great whether it's raw and crunchy, or cooked and soft. A carrot can pull off being the star of the dish, yet just as happily complement other ingredients. Carrot and pear soup, adapted from "Emily the Great's Carrot and Pear Soup"
is the rough proportion for this soup. You can adjust to your preference, of course. into roughly similar-sized cubes; smaller pieces will help the soup cook faster. cool a little, then transfer to a blender to make a smooth soup. Mince the garlic and onion; chop the carrot and pear into small cubes. In a saucepan, sauté the onions and garlic in a little olive oil. Cook until the onions become translucent. Add the chopped carrots and sauté with the garlic and onions for about a minute before adding the pear and stock. Bring to the boil and immediately lower the heat to a simmer. Cook until carrots are done, about 20-25 minutes of simmering. Blend to a smooth mixture using a blender. At this point, you can spoon out portions for your baby. If serving to grown-ups, taste the soup and adjust with seasonings: salt, freshly ground black pepper, and heavy cream. Ladle to bowls and add a dollop of greek yogurt, if desired. Garnish with chopped parsley and serve with toasted bread. If not vegetarian, this is great topped with some crisp bacon or pancetta. You can also use chicken stock instead of vegetable stock. I'm sure it's pretty obvious, but make sure to clean your blender before using to make baby food. We rinse ours with boiling water before each use. Peel the carrots and potatoes. Roughly chop into 1/2-inch cubes. Place all in a pot and add enough cold water to cover. Place the lid and bring to a boil. Lower the heat to medium and cook for about 20-25 minutes, or until cooked and tender. Remove from heat and drain off the water. Mash the mixture together to your desired consistency. Take out the servings for your baby and place in a different (sterilized) bowl. Add enough milk to achieve the consistency that is appropriate for your baby's age. 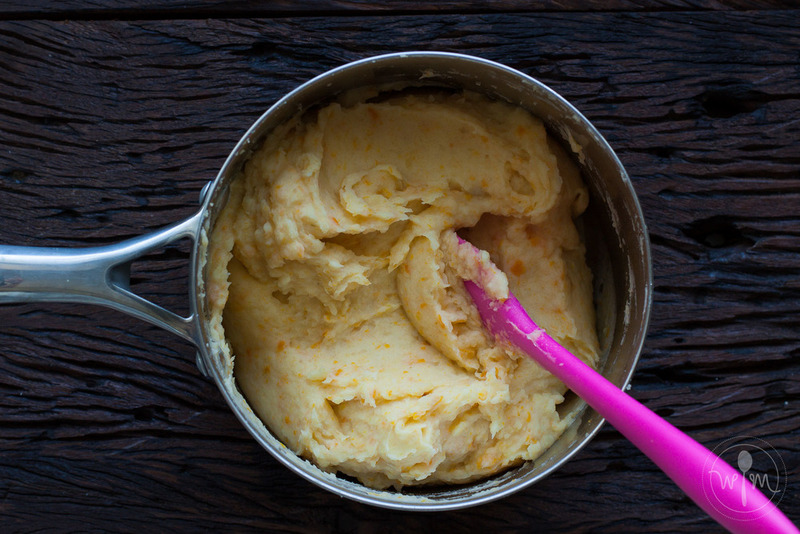 Add your preferred amounts of butter, milk, cream, and salt to the rest of the mash. Enjoy with your stews and roasted meats. This recipe is adaptable, feel free to change up the proportions. This freezes well, but use immediately once thawed. The sweet potatoes seem to make this have a watery consistency if left in the fridge for too long. Chop the carrots and squash into roughly similar-sized pieces. Chop the onions, mince the garlic. Place a saucepan over medium heat. Once hot, add a tablespoon of your preferred cooking oil and immediately sauté the onions and garlic. Add the ginger and sauté until fragrant and onions are translucent. Add the carrots and squash and sauté for a minute. Add the stock and bring to a boil. Immediately lower to a simmer and cook until the vegetables are tender. At this point, you can spoon out servings for your baby. Adjust salt, if needed. If serving to grown-ups, add coconut cream; start with 1/4 cup, taste it and add more as desired. Add curry powder, salt and pepper to taste. Top with fresh cilantro or parsley, and serve hot with toasted bread. If your baby is over one year, you can try adding coconut milk earlier in the cooking so your baby has it in his/her servings too. If not vegetarian, I recommend using chicken stock and topping the soup with bits of bacon or pancetta.